Google recently acquired eight high profile start-up robotics companies, providing strong evidence of a strategy to create breakthrough applications for robotics over the next decade. This strategy is most likely to concentrate on manufacturing and logistics. Rubin describes Google's highly ambitious goal of finding technically and economically viable applications for robotics as a "moon shot": a highly concentrated effort of an integrated team to create landmark achievements in a field. 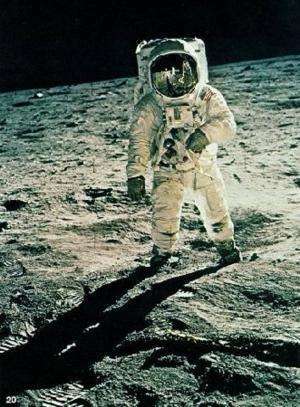 The mission to put a man on the moon is one clear precedent. There are many other possible analogies for Google's robot "moon shot". Journalist Tom Green, writing in Robotics Business Review, compares Google's contribution to the robotics industry to the US Defense Advanced Research Projects Agency's (DARPA) pivotal role in establishing the founding technologies of the internet. In expanding Google's investments in robotics, Rubin will face the challenge of integrating the companies that form Google's moon shot at Palo Alto, California. What is notable about many of these companies is they are either interdisciplinary in orientation, or highly specialised. This film included sequences that began as computer-generated imagery, which was matched with live action sequences using robotic cameras. In the clip below, robot cameras captured the astronaut's faces as they spun around in zero gravity. Bot & Dolly's design studio arm Autofuss emphasises its collaborative approach "colliding visual artists with programmers, engineers with designers, storytellers with illustrators, architects with machinists". "new generation arm" for robots […] that does for robotics what the Apple II did for computers: get the hardware out of factories and into homes. They aimed to produce product-level robots that could work at a level and speed comparable to humans unloading trucks (see Casey Nobile's article in Robotics Business Review). Industrial Perception's goals seem in line with Google's goals with their move into robotics. The goal of the competition was to complete tasks to a rescue robot that could drive a vehicle, walk on uneven ground, walk up an industrial ladder, clear debris, open a door, cut through a wall, open a valve and use a hose. The only non-US competitor, Schaft's robot scored 27 out of 32 points and beat the Boston Dynamics team by some margin. In spite of the growing investments in robotics, longer term questions about the future models for robotics in everyday life remain open. How key components—from machine vision to directional wheels, from automated cameras to humanoid rescue robots—might combine into transformative applications is yet to be seen. Also yet to be known is the impact of Google's taking cream from the top of a still-young robotics industry. If we can get a decent power source for these robots, then they will be viable. Until then, they are just fancy appliances. Maybe some wireless power source could be used, allowing the robots to function within a given area, untethered. It would also be much safer since the robots cannot "go wild", outside of a given area, at least. Dude you know what I meant. A robot with a wire is not as useful as one with internal power.